This article is about the source of Biblical stories. For the source of the Q conspiracy theory, see QAnon. The Q source (also called Q document, Q Gospel, or Q from German: Quelle, meaning "source") is a hypothetical written collection of primarily Jesus' sayings (logia). Q is part of the common material found in the Gospels of Matthew and Luke but not in the Gospel of Mark. According to this hypothesis, this material was drawn from the early Church's Oral Tradition. Along with Marcan priority, Q was hypothesized by 1900, and is one of the foundations of most modern gospel scholarship. B. H. Streeter formulated a widely accepted view of Q: that it was written in Koine Greek; that most of its contents appear in Matthew, in Luke, or in both; and that Luke more often preserves the text's original order than Matthew. 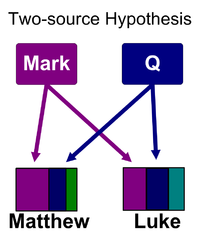 In the two-source hypothesis, the three-source hypothesis and the Q+/Papias hypothesis Matthew and Luke both used Mark and Q as sources. Some scholars have postulated that Q is actually a plurality of sources, some written and some oral. Others have attempted to determine the stages in which Q was composed. Q's existence has been questioned. Omitting what should have been a highly treasured dominical document from all early Church catalogs, its lack of mention by Jerome is a conundrum of modern Biblical scholarship. But copying Q might have been seen as unnecessary as it was preserved in the canonical gospels. Hence, it was preferable to copy the Gospels of Matthew and Luke, "where the sayings of Jesus from Q were rephrased to avoid misunderstandings, and to fit their own situations and their understanding of what Jesus had really meant". Despite challenges, the two-source hypothesis retains wide support. For centuries, biblical scholars followed the Augustinian hypothesis: that the Gospel of Matthew was the first to be written, Mark used Matthew in the writing of his, and Luke followed both Matthew and Mark in his (the Gospel of John is quite different from the other three, which because of their similarity are called the Synoptic Gospels). Nineteenth-century New Testament scholars who rejected Matthew's priority in favor of Markan priority speculated that Matthew's and Luke's authors drew the material they have in common with the Gospel of Mark from Mark's Gospel. But Matthew and Luke also share large sections of text not found in Mark. They suggested that neither Gospel drew upon the other, but upon a second common source, termed Q.
Herbert Marsh, an Englishman, is seen by some as the first person to hypothesize the existence of a "narrative" source and a "sayings" source, although he included in the latter parables unique to Matthew and unique to Luke. In his 1801 work, A dissertation on the Origin and Composition of our Three First Canonical Gospels, he used the Hebrew letter Aleph (א) to denote the narrative source and the letter beth (ב) to denote the sayings source. The next person to advance the "sayings" hypothesis was the German Friedrich Schleiermacher in 1832. Schleiermacher interpreted an enigmatic statement by the early Christian writer Papias of Hierapolis, c. AD 95–109 ("Matthew compiled the oracles (logia) of the Lord in a Hebrew manner of speech, and everyone translated them as well he could") as evidence of a separate source. Rather than the traditional interpretation—that Papias was referring to the writing of Matthew in Hebrew—Schleiermacher proposed that Papias was actually referring to a sayings collection of the apostle Matthew that was later used, together with narrative elements, by another "Matthew" and by the other Evangelists. In 1838 another German, Christian Hermann Weisse, took Schleiermacher's suggestion of a sayings source and combined it with the idea of Markan priority to formulate what is now called the Two-Source Hypothesis, in which both Matthew and Luke used Mark and the sayings source. Heinrich Julius Holtzmann endorsed this approach in an influential treatment of the synoptic problem in 1863, and the two-source hypothesis has dominated ever since. At this time, the second source was usually called the Logia, or Logienquelle (logia-source), because of Papias's statement, and Holtzmann gave it the symbol Lambda (Λ). But toward the end of the 19th century, doubts began to grow about the propriety of anchoring its existence to Papias's account. So the symbol Q (which was devised by Johannes Weiss to denote Quelle, meaning source) was adopted to remain neutral about the connection of Papias to the collection of sayings. This two-source hypothesis speculates that Matthew borrowed from both Mark and Q. For most scholars, Q accounts for what Matthew and Luke share—sometimes in exactly the same words—but that are absent in Mark. Examples are the Devil's three temptations of Jesus, the Beatitudes, the Lord's Prayer, and many individual sayings. Throughout the remainder of the 20th century, there were various challenges and refinements of Streeter's hypothesis. For example, in his 1953 book The Gospel Before Mark, Pierson Parker posited an early version of Matthew (Aramaic M or proto-Matthew) as the primary source. Parker argued that it was not possible to separate Streeter's "M" material from the material in Matthew parallel to Mark. In the early 20th century, more than a dozen reconstructions of Q were made. But these reconstructions differed so much from each other that not a single verse of Matthew was present in all of them. As a result, interest in Q subsided and it was neglected for many decades. This state of affairs changed in the 1960s after translations of a newly discovered and analogous sayings collection, the Gospel of Thomas, became available. James M. Robinson of the Jesus Seminar and Helmut Koester proposed that collections of sayings such as Q and Gospel of Thomas represented the earliest Christian materials at an early point in a trajectory that eventually resulted in the canonical gospels. This burst of interest after the Gospel of Thomas's discovery led to increasingly more sophisticated literary reconstructions of Q, and even to redactional speculation, notably in the work of John S. Kloppenborg. Kloppenborg, by analyzing certain literary and thematic phenomena, argued that Q was composed in three stages. In his view, the earliest stage was a collection of wisdom sayings involving such issues as poverty and discipleship. Then, he posits, this collection was expanded by including a layer of judgmental sayings directed against "this generation". The final stage included the Temptation of Jesus narrative. Although Kloppenborg cautioned against assuming that Q's composition history is the same as the history of the Jesus tradition (i.e., that the oldest layer of Q is necessarily the oldest and pure-layer Jesus tradition), some recent seekers of the Historical Jesus, including members of the Jesus Seminar, have done just that. Basing their reconstructions primarily on the Gospel of Thomas and the oldest layer of Q, they propose that Jesus functioned as a wisdom sage, rather than a Jewish rabbi, though not all members affirm the two-source hypothesis. Kloppenborg is now a fellow of the Jesus Seminar himself. But scholars supporting the three-stage Q development hypothesis, such as Burton L. Mack, argue that Q's unity comes not only from its being shared by Matthew and Luke, but also because, in the layers of Q as reconstructed, the later layers build upon and presuppose the earlier ones, whereas the reverse is not the case. So evidence that Q has been revised is not evidence for disunity in Q, since the hypothesised revisions depend upon asymmetric logical connections between what are posited to be the later and earlier layers. Some biblical scholars believe that an unknown redactor composed a Greek-language proto-Gospel. It may have been circulating in written form about the time the Synoptic Gospels were composed (i.e., between late 50s and mid 90s AD). The name Q was coined by the German theologian and biblical scholar Johannes Weiss. The relationship among the three synoptic gospels goes beyond mere similarity in viewpoint. The gospels often recount the same stories, usually in the same order, sometimes using the same words. Scholars note that the similarities between Mark, Matthew, and Luke are too great to be coincidental. If the two-source hypothesis is correct, then Q would probably have been a written document. If Q was a shared oral tradition, it is unlikely that it could account for the nearly identical word-for-word similarities between Matthew and Luke when quoting Q material. Similarly, it is possible to deduce that Q was written in Greek. If the Gospels of Matthew and Luke were referring to a document that had been written in some other language (Aramaic for example), it is highly unlikely that two independent translations would have exactly the same wording. The Q document must have been composed before Matthew and Luke. Some scholars even suggest that Q predated Mark. A date for the final Q document is often placed in the 40s or 50s of the first century, with some arguing its so-called sapiential layer (1Q, containing six wisdom speeches) was written as early as the 30s. If Q existed it has since been lost. Some scholars believe it can be partially reconstructed by examining elements common to Matthew and Luke (but absent from Mark). This reconstructed Q does not describe the events of Jesus' life: Q does not mention Jesus' birth, his selection of the 12 disciples, his crucifixion, or the resurrection. Instead, it appears to be a collection of Jesus' sayings and quotations. Sometimes the exactness in wording is striking, for example, Matthew 6:24 = Luke 16:13 (27 and 28 Greek words respectively); Matthew 7:7–8 = Luke 11:9–10 (24 Greek words each). There is sometimes commonality in order between the two, for example the Sermon on the Plain and Sermon on the Mount. The presence of doublets, where Matthew and Luke sometimes each present two versions of a similar saying but in different context, only one of those versions appearing in Mark. Doublets may be considered a sign of two written sources, i.e., Mark and Q.
Luke mentions that he knows of other written sources of Jesus' life, and that he has investigated in order to gather the most information. The fact that no Q manuscripts exist today does not necessarily argue against its existence. Many early Christian texts no longer exist, and we only know they did from their citation or mention in surviving texts. Once Q's text was incorporated into the body of Matthew and Luke, it was no longer necessary to preserve it, just as interest in copying Mark seems to have waned substantially once it was incorporated into Matthew. The editorial board of the International Q Project writes: "During the second century, when the canonizing process was taking place, scribes did not make new copies of Q, since the canonizing process involved choosing what should and what should not be used in the church service. Hence they preferred to make copies of the Gospels of Matthew and Luke, where the sayings of Jesus from Q were rephrased to avoid misunderstandings, and to fit their own situations and their understanding of what Jesus had really meant." While the two-source hypothesis remains the most popular explanation for the synoptic gospels' origins, the existence of the "minor agreements" has raised serious concerns. These minor agreements are those points where Matthew and Luke agree against or beyond Mark precisely within their Markan verses (for example, the mocking question at the beating of Jesus, "Who is it that struck you?" [Luke 22:64//Matthew 26:68], found in both Matthew and Luke but not in Mark, although it should be noted that this "minor agreement" falls outside the usually accepted range of Q.) The "minor agreements" call into question the proposition that Matthew and Luke knew Mark but not each other, e.g. Luke might have indeed been following Matthew, or at least a Matthew-like source. Peabody and McNicol argue that until a reasonable explanation is found the two-source hypothesis is not viable. Secondly, how could a major and respected source, used in two canonical gospels, disappear? If Q did exist, it would have been highly treasured in the early Church. It remains a mystery how such an important document, which was the foundation for two canonical Gospels, could be lost. An even greater mystery is why the extensive Church catalogs compiled by Eusebius and Nicephorus would omit such an important work yet include such non-canonical accounts as the Gospel of Peter and the Gospel of Thomas. The existence of a treasured sayings document in circulation going unmentioned by early Church Fathers remains one of the great conundrums of modern Biblical scholarship. Pier Franco Beatrice argues that until these issues are resolved, Q will remain in doubt. Some scholars argue that the Gospel according to the Hebrews was the basis for the synoptic tradition. They point out that in the first section of De Viris Illustribus (Jerome), we find the Gospel of Mark where it should be as it was the first gospel written and was used as a source for the later gospels. Following it should be Q. But not only is Q not where it should be at the top of Jerome's list, this treasured work recording the Logia of Christ is mentioned nowhere by Jerome. Rather, the first seminal document is not Q but the Gospel according to the Hebrews. Austin Farrer, Michael Goulder, and Mark Goodacre have also argued against Q, maintaining Markan priority, claiming the use of Matthew by Luke. This view has come to be known as the Farrer hypothesis. Their arguments include: Farrer, in his 1955 paper that first outlined this hypothesis, notes that when we find two documents that contain common material, identical in the words and phrases they use to describe some scenes, the simplest explanation is that one of the two used the other as a source, rather than both using a third document as a source. Goulder points to common Matthean phrases such as "brood of vipers", "make fruit", and "cast into the fire" that each appear in Luke only once, in a Q passage. Goulder's conclusion, based on writing styles, is that Matthew is the source for these "Q" sayings. Goodacre notes that there is no extant copy of Q and that no early church writer makes an unambiguous reference to a document resembling the Q that modern scholars have reconstructed from the common material in Luke and Matthew. While supporters say that the discovery of the Gospel of Thomas supports the concept of a "sayings gospel", Mark Goodacre points out that Q has a narrative structure as reconstructed and is not simply a list of sayings. ^ Funk, Robert W., Roy W. Hoover, and the Jesus Seminar. The Five Gospels. HarperSanFrancisco. 1993. "Introduction," pp. 1–30. ^ D. R. W. Wood, New Bible Dictionary (InterVarsity Press, 1996), 739. ^ Hultgren, Stephen (2002). Narrative Elements in the Double Tradition. Walter de Gruyter. pp. 4–5. ^ Yarbrough, Robert W. (Jun 1983). "The Date of Papias: A Reassessment" (PDF). Journal of the Evangelical Theological Society. 26 (2): 181–191. ^ Hultgren, Stephen (2002). Narrative Elements in the Double Tradition. Walter de Gruyter. pp. 9–10. ^ Streeter, Burnett H. The Four Gospels. A Study of Origins Treating the Manuscript Tradition, Sources, Authorship, & Dates. London: Macmillan and Co., Ltd., 1924. ^ Everett Falconer Harrison, Introduction to the New Testament, Wm. Eerdmans 1971 p. 152. ^ The Lost Gospel: The Book Q and Christian Origins, Macmillan Co. (1993, paperback 1994). ^ "Britannica". Britannica. Retrieved April 15, 2012. ^ Tony Honoré, "A Statistical Study of the Synoptic Problem." Novum Testamentum Aug. 10-July (1968): 95–147. On page 96 Honoré compares the similarities between the three Gospels with the number of words in common. ^ * Ehrman, Bart D. (2004). The New Testament: A Historical Introduction to the Early Christian Writings. New York: Oxford. p. 84. ISBN 978-0-19-515462-7. ^ See C.M. Tuckett, "The Existence of Q", p. 19–48, in The Gospel Behind the Gospels: Current Studies on Q. Edited by R. Piper. Leiden: Brill, 1995 (espcially p. 20). ^ James R. Edwards (2009). The Hebrew Gospel & the Development of the Synoptic Tradition. Wm. B. Eerdmans Publishing. pp. 209–47. ISBN 9780802862341. Retrieved April 15, 2012. ^ Powell, Evan (February 17, 2006). The Myth of the Lost Gospel. Symposium Press. ISBN 978-0-9770486-0-1. ^ a b c "Ten Reasons to Question Q". Markgoodacre.org. January 10, 2003. Retrieved April 15, 2012. ^ Pierson Parker (Dec 1940). "A Proto-Lucan basis for the Gospel according to the Hebrews". Journal of Biblical Literature. 59 (4): 471–78. doi:10.2307/3262407. JSTOR 3262407. ^ Lillie, Arthur (2005). The Gospel According to the Hebrews. Kessinger Publishing. pp. 111–34. ISBN 978-1-4253-7051-0. ^ a b Jerome, Saint (1999). Ste. Jerome, On illustrious men 1:4. ISBN 9780813201009. ^ Jerome, Saint (1999). Ste. Jerome, On illustrious men 3:1. ISBN 9780813201009. ^ a b Austin M. Farrer, "On Dispensing with Q" in D. E. Nineham (ed. ), Studies in the Gospels: Essays in Memory of R. H. Lightfoot (Oxford: Blackwell, 1955), pp. 55–88, reproduced at "Archived copy". Archived from the original on February 1, 2009. Retrieved October 15, 2011. CS1 maint: Archived copy as title (link). ^ a b For example, Michael Goulder, "Is Q a Juggernaut", Journal of Biblical Literature 115 (1996), pp. 667–81, reproduced at "Archived copy". Archived from the original on July 8, 2007. Retrieved July 17, 2007. CS1 maint: Archived copy as title (link). ^ These statistics are taken from an analysis by Walter M. Shandruk of Frans Neirynck's The Minor Agreements of Matthew of Luke and Mark with a Cumulative List, Leuven University Press, 1974. The results of Shandruk's analysis have been posted at http://neonostalgia.blogspot.com/2005/09/minor-agreements-against-mark.html. ^ Robert L. Thomas Three views on the origins of the Synoptic Gospels 2002 pp. 255, 322 "Farnell's third axiom notes, quoting Linnemann, that the reason for four independent Gospels stems from the legal principle of Deuteronomy 19:15b: "[O]n the evidence of two or three witnesses a matter shall be confirmed."" ^ Thomas, Robert L.; Farnell, F. David (January 1, 1998). The Jesus Crisis: The Inroads of Historical Criticism Into Evangelical Scholarship. Kregel Publications. p. 136. ISBN 9780825438110 – via Google Books. ^ Reconstruction of Q by the International Q Project. ^ Clayton N. Jefford (1989). The Sayings of Jesus in The Teaching of the Twelve Apostles. ISBN 978-9004091276. Retrieved April 29, 2012. ^ A. M. H. Saari (July 26, 2006). The Many Deaths of Judas Iscariot: A Meditation on Suicide. ISBN 9780203087480. Retrieved April 29, 2012. Herbermann, Charles, ed. (1913). "Jesu Logia ("Sayings of Jesus")" . Catholic Encyclopedia. New York: Robert Appleton Company.